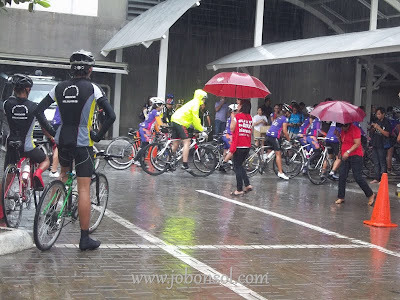 The rains won't stop them from saving 500 women against cervical cancer. 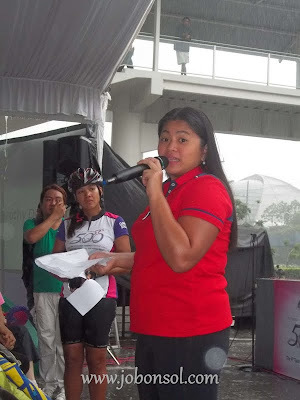 I've just attended the kick-off of Tour of Hope 2011: Going the Xtra Mile Against Cervical Cancer at the Trinoma Mall Parking lot yesterday morning attended by Councilor Doray Delarmente in behalf of QC Mayor Herbert Bautista, celebrities and famous personalities. 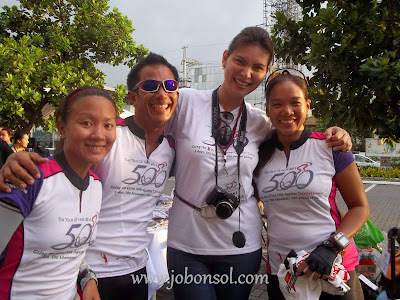 Cervical cancer advocates, Team David's Salon with David Charlton, Ernie Lopez and GSK President and managing director Mr. Roberto Taboada, Dr. Cecilia Llave of CECAP, Trisha Chongbian-Concepcion, Bravehearts President Abbygale Arenas-De Leon led the cyclists to kick off from Trinoma to the first stop in Tarlac City. From the attendees of the event, Quezon City Health Directors and Councilor Doray Delarmente provided simultaneously lay lecture to also give 100 vaccines to participants sponsored by GlaxoSmithKline and others. The Tour of Hope is organized by Bravehearts in collaboration with the UP Cancer Institute Foundation's Cervical Cancer Prevention(CECAP) Network Program and GlaxoSmithKline Philippines. Team David's Salon, the first all-woman sports team in the country is also a consistent partner who have always participated in the advocacy. Bravehearts president Abbygale Arenas-De Leon also thanked her husband Jun De Leon for religiously documenting the events soon to be mounted as a photo exhibit for the benefit of the Tour of Hope 2011. Aside from the generous support of Jun De Leon, she also expressed her gratitude to Bravehearts who will conduct the lay lectures with Cervical Cancer Prevention (CECAP) Network Program during each pit stop, Gatorade, the number 1 sports drink in the country, quenching the thirst of the participants as they travel under the summer heat, Rudy Project and EFX, who collaborated to create the EFX Awareness Band in honor of the advocacy, with 25% of the sales to fund Bravehearts future projects, Shell, 7-Eleven Philippines, McDonald's, Sweet Bella, The Primer Group of Companies, R.O.X., Columbia Sportswear, Holcim, Medicard, Philippine Charity Sweepstakes (PCSO), Pioneer Insurance, GeiserMaclang Marketing Communications, EON Stakeholder Relations Firm, Graphic Library Inc., Rupert Sign and Display Service and other sponsors. 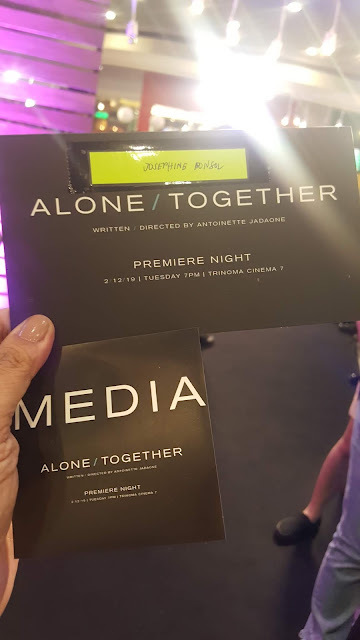 Media partners acknowledged were Business Mirror, Health and Fitness, BusinessWorld, Manila Bulletin, Health Today, Total Fitness, ABS-CBN.com, Spot.ph, FemaleNetwork.com and Herword.com. 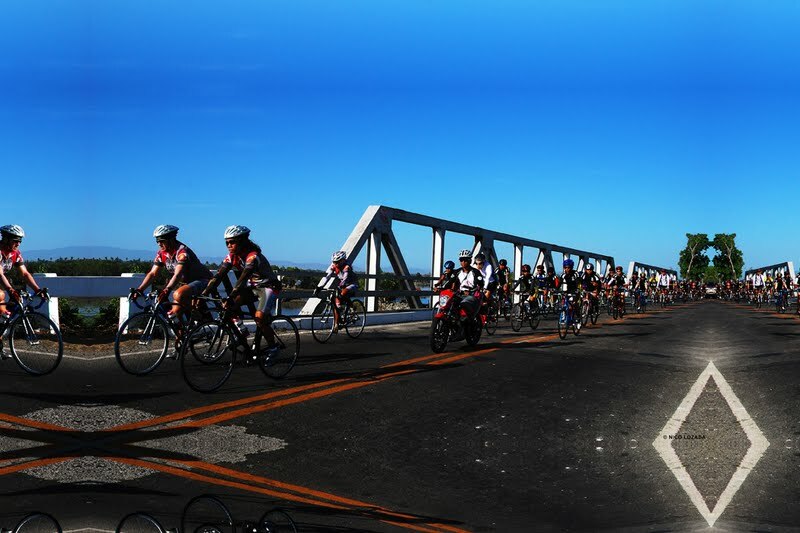 From QC, the cyclists will stop first in Tarlac City, Tarlac. 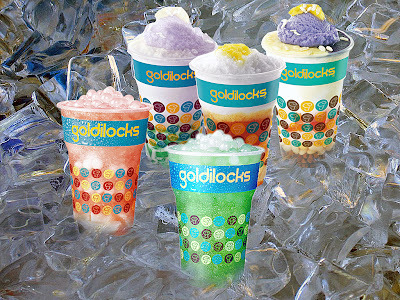 Aside from being the home of President Noynoy Aquino’s ancestral house, it is also where the Dolores Spring Well can be found. It is a favorite spot for religious excursionists, and the water from this popular tourist destination is believed to have healing effects. 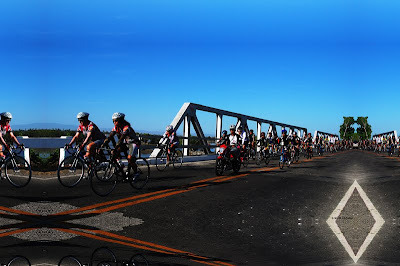 From there, the tour will continue to San Fernando, La Union, where white sand beaches can be found along the city’s coastline. Afterwards, the bikers will head to Vigan City, Ilocos Sur, where over 180 historical landmarks and ancestral homes are located. The fourth stop will be Laoag City, Ilocos Norte, where tourists often visit the Juan Luna Shrine. There, art enthusiasts and admirers of the award-winning Spolarium painter’s works can get a glimpse of his life through artifacts and vintage photographs. 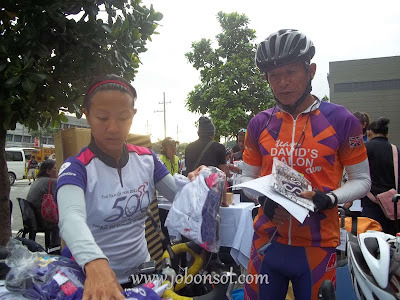 On June 1, which is the last day of the Tour, there will be a special celebrity leg in Ilocos Norte for the Bravehearts celebrity advocates such as Anthony Pangilinan, who will be cycling with his son Donny; Pia Magalona, model/actor Will Devaughn; models/actresses Wendy Valdez and Janna Victoria; TV host Rovilson Fernandez; Amazing Race Asia Winners Richard Herrera and Richard Hardin, who will be joined by his fiancée Andrea Barandiaran; COMELEC Commissioner Gregorio Larrazabal; Senator Pia Cayetano; and many more. They will be flown in from Manila to Laoag by Cebu Pacific, which is also an official event partner of The Tour of Hope, so they can lend their star power to promote the advocacy. Bravehearts is a non-profit organization initially led by the Cervical Cancer Prevention Network (CECAP) for the Cancer Institute Foundation (CIF). 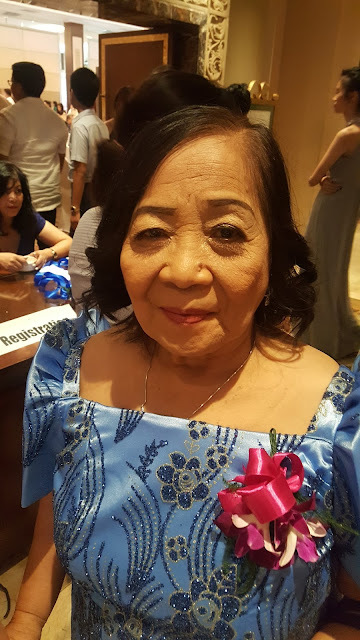 It is dedicated to raising awareness on cervical cancer prevention and is supported by a growing number of women, including prominent personalities such as Abbygale Arenas-de Leon, who is the current president of the organization, Senator Loren Legarda, Pia Magalona, Ellen Tordesillas, Tessa Prieto-Valdes, Jeena Lopez, Maimai Davao, Joyette Jopson, and Suzi Entrata. For further inquiries, please email braveheartsphilippines@gmail.com. 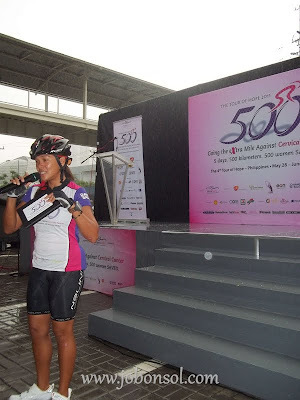 To be a part of “The Tour of Hope 2011 – 500: Going the Xtra Mile Against Cervical Cancer,” please email Joyette Jopson at joyette.jopson@gmail.com or contact her at 0917-8827352.